The UAE had ratified an extradition treaty with India in May 2013, and India had filed Michel’s extradition request before the Dubai Public Prosecution in February last year. 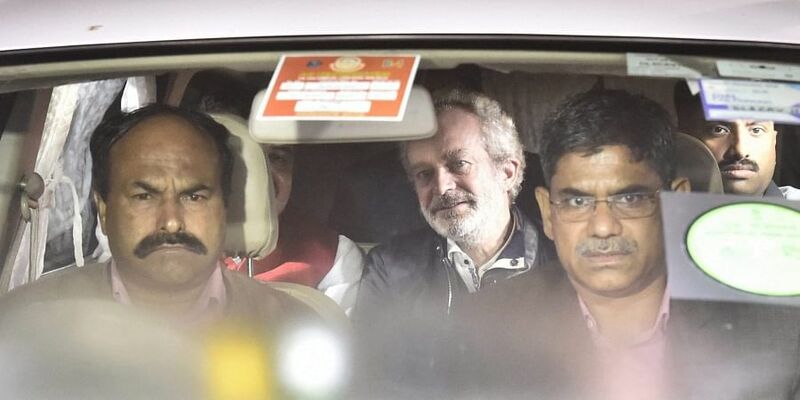 NEW DELHI: Christian James Michel, a powerful middleman in the scam-tainted AgustaWestland helicopter deal, on Tuesday became the first major economic fugitive to be extradited under Narendra Modi’s watch as prime minister. He arrived in Delhi from Dubai on a private Gulfstream jet around 10.35 pm. The extradition is a major shot in the arm for the government, which has been facing constant attacks from the Congress on the Rafale jet deal with France, and comes months ahead of next year’s parliamentary elections. Reports said a team of Indian officials had reached Dubai late last week to finalise the extradition. The UAE had ratified an extradition treaty with India in May 2013, and India had filed the Michel’s extradition request before the Dubai Public Prosecution in February last year. Michel was arrested, and when the case came up for hearing in a Dubai court in July, he pleaded not guilty. In September this year, the Dubai Appeal Court approved the extradition request, but this too, was challenged by Michel’s lawyers. But on November 19, Dubai’s Cassation court rejected Michel’s lawyer Bin Suwaidan’s argument that the case was politically motivated and that his client would be mistreated by the Indian authorities and upheld the appellate court’s decision, clearing the way for his extradition. Michel reportedly received EUR 30 million (Rs 225 crore) from AgustaWestland for paying politicians and bureaucrats for firming up a Rs 3,600 crore order for 12 AgustaWestland AW101 for VVIPs signed in 2010. But the order was put on hold and finally cancelled in 2014 after an Italian court arrested chairman of Finmeccanica (the parent company AgustaWestland) Giuseppe Orsi and CEO of AgustaWestland Bruno Spagnolini on charges of bribing middlemen to secure the deal with the IAF. Though the government recovered most of the money paid to AgustaWestland, questions were raised about the role of then PM Manmohan Singh, former defence minister A K Antony, UPA chairperson Sonia Gandhi, her close aide and MP Ahmed Patel and former IAF chief S P Tyagi in finalising the deal. Tyagi reportedly had the original flight ceiling required by the IAF reduced to get Agusta enter the bid.